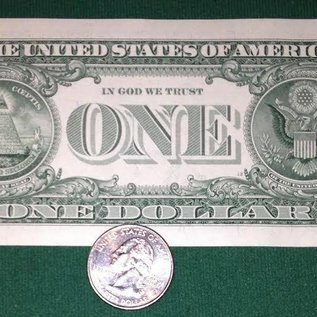 Coin vanishes and reappears in the folds of a dollar bill. 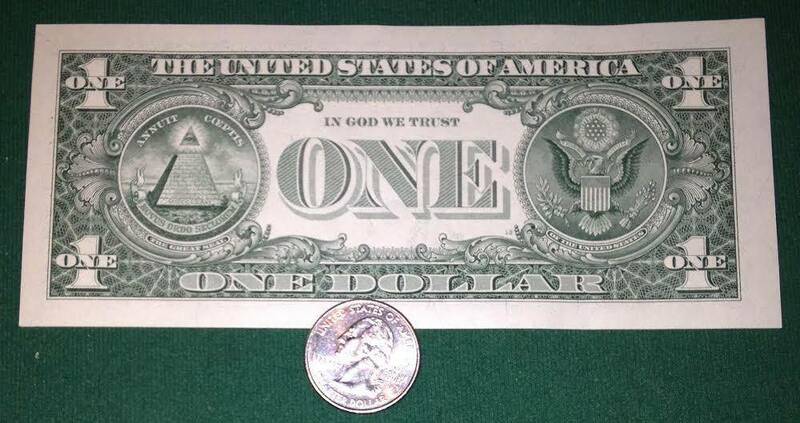 A dollar bill is shown freely on both sides. It is folded in half and then folded once more. You drop a borrowed quarter into the folded bill, unfold it and the coin has vanished. Fold it once again and dump the quarter from within the folds of the bill! Bye George was created by Al Lagomarsino. Please note: This is This is a pre-made gimmick and not the updated and now out of print DVD from Howard Baltus of The Trickery and Al Lagomarsino teaching you how to make a revised version of the gimmick with an eight coin production from the bill and then produce a jumbo coin as a finale. This version had an additional gimmick and you would have had to purchase 4 Expanded Quarters and a Jumbo Coin in order to do that effect.